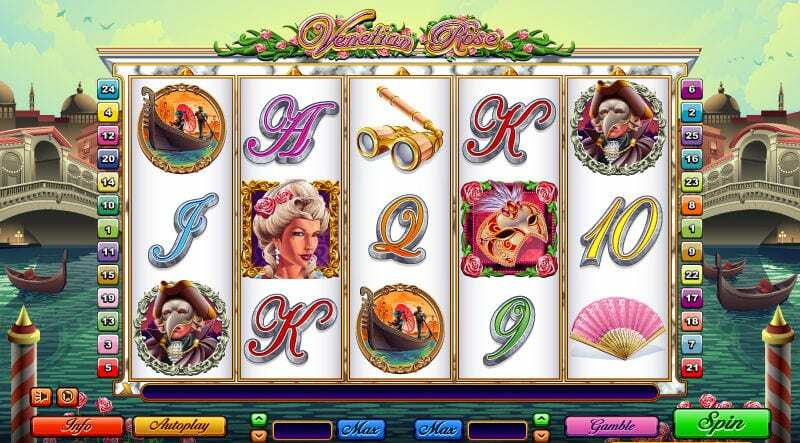 If you're wanting to play video slots then step onto the Gondola for a trip through Venice and you will be joined by some debonair beauties for a journey through 5 reel slots, 25 paylines and the opportunity to double and quadruple your wins. After 23 years of gaming experience providing some of the best online casino games and slots promotions on the market, it’s safe to say Microgaming know a thing or two about creating worlds you’ll want to return to. Enjoy graphics you’ll practically get lost in, characters you know and love - or new ones you’ll love to get to know. These prizes are definitely worth playing for. Microgaming is at the top of their game. Go ahead and try to play slot games. Cast your eyes out onto the waters of Venice that gleam beneath the warm Venetian sunset, watch as the gondolas drift and the eyes of young lovers rove as another enchanting evening begins. Get your hands on this top-rated slot game as soon as possible! In a place where opulence rules and you’re never too far away from a fanned face or a hand kiss, the setting of Venetian Rose has all of the beauty and history of a classic painting. Now throw in 5 reels, 25 paylines, the chance to win 10 free spins, and an option that will get tactical players’ pulses racing, and you’ve got a slot machine game that will entertain for far longer than any painting. As you look out onto the boats, you’ve got your scenic view sorted, but where does the action start? From as little as a penny, that’s where. Bets start at just 1p, meaning you don’t have to be aristocracy to get in on the fine Venetian lifestyle. If you’re feeling lavish, the maximum bet is £250, but you don’t have to splash out just because we’re near a canal. There are a couple of nice bonus features that can help you out along the way. Look out for your scatter, which in the city of Venice comes in the form of a red mask. Get 3 or more of these across your 5 reels and you could have another 10 free games – and whatever you win is tripled. 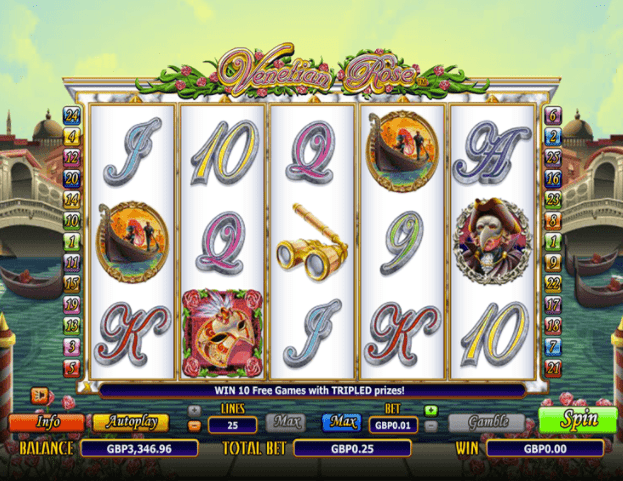 The second bonus feature is one for the more experienced player; Venetian Rose gives you the option to gamble what you’ve just won and been in with a chance of receiving double or quadruple your payout. So use this with caution, and you might be walking away with a few more jangles in your pocket. You’ll find many other masks during your time here, which are worth 200 times your bet if you find between 2 and 5. And the rewards keep on coming – find 5 pink fans or 5 of the same pair of opera glasses and you times your bet by 250, with prizes for matching letter and number symbols too. Among the beautiful 16th century-inspired symbols are, of course, your wild, and where the game gets its very name: the Venetian Rose, a fancy lady in traditional garb. If she appears, she’ll take the place of your other symbols and could time your bet by as much as 3,000. She’s a keeper! 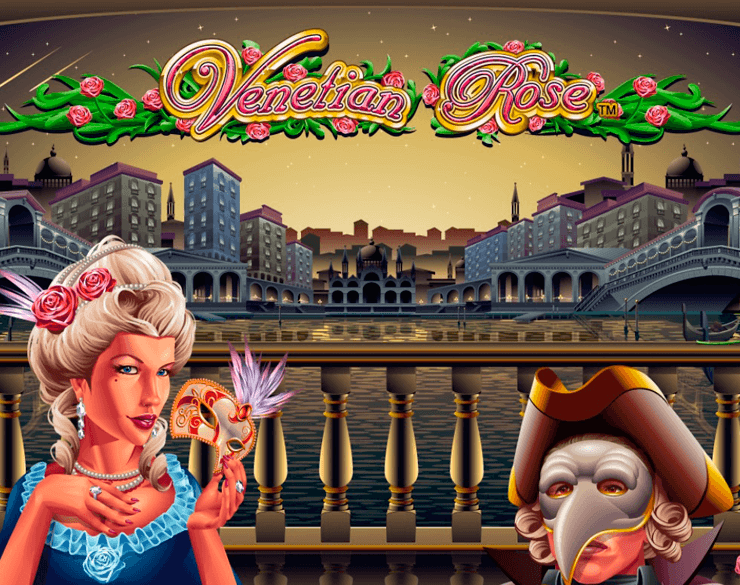 With undoubtedly pretty prizes and a setting that harks back to times of street theatre and dramatic dresses, Venetian Rose brings you thrills better than any gondola ride can ever offer. For a 10/10 offering try starburst online.